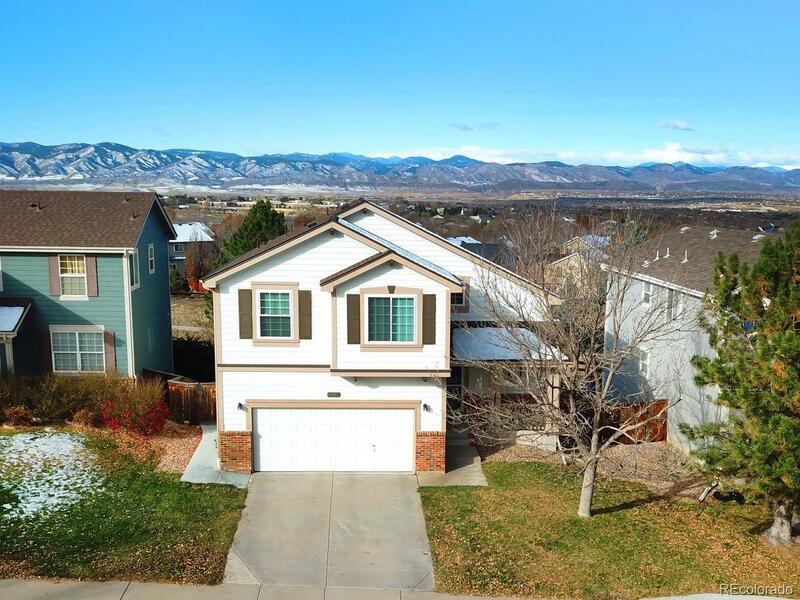 Wonderful 2 story home located on open space with unobstructed million dollar mountain views! Located on quiet cul-de-sac street, close to trails, parks, schools this well cared for home features 4 bedrooms up plus the professionally finished walkout basement that adds another bedroom/office and a full bath plus a rec room/media room. The updated kitchen has abundant cabinet space, beautiful quartz counters and all of the stainless steel appliances stay, including the smooth top range with double oven and refrigerator. Open to the kitchen and dining area the living room/great room is bright and airy with soaring vaulted ceiling and is well appointed with plantation shutters, built-ins and cozy gas log fireplace. Step outside on your beautiful composite, low maintenance deck and take in your gorgeous views while the under-deck ceiling/drainage system will keep you dry in the rain on the patio below. Well maintained inside and out this home is sure to please!